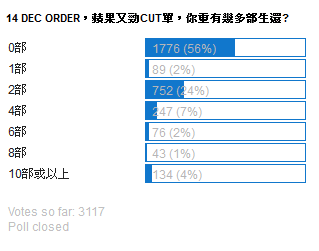 IPHONE FOR HONG KONG: 14 Dec Order，蘋果又勁Cut單，你重有幾多部生還? why would someone have 10??? ON9 CUT ALL, EVEN NEW ADDRESSES, NAME, CREDIT CARD, EMAIL! 落四部 (16G Bx2, 32G Wx2), 無 CUT 到, 兩部到左. all my 12 order(2pcs each order) safe, 3 cut. Suggest that make a call to complain... I did it.. Already complaint, but no use, standard answer.